The B-Wings are from the third film. Or the sixth film depending on how you are counting. They are shaped like a cross, with the pilot’s cabin at the end of one of the short arms. The idea is that they can fly in any orientation and the cockpit rotates so the pilot is always upright. They only appear for a second or two in the film, heading towards the new death star, and are flying in vertical mode with the long arm downwards. The ship miniatures are positioned this way. However according to all the many novels, comics, and rpgs out there, when engaged in combat B-Wings fly in horizontal mode with the long arm out to the side. This looks much cooler, and is how the ship is portrayed in the art on the pilot cards. 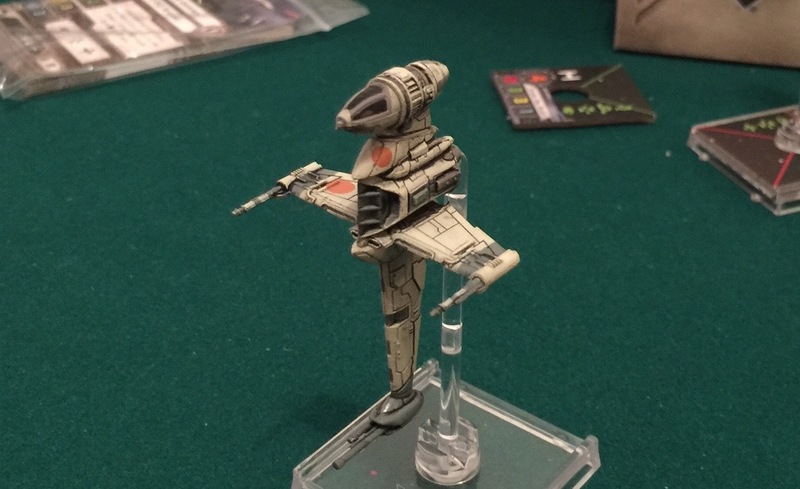 The B-Wings on the cards are all flying sideways. Given that I successfully fixed my TIE Fighter, I am thinking of somehow cutting the connector off the B-Wing and gluing it back on at right angles, so the ship will fly horizontally. It might be a bit awkward as it will stick out and could get in the way, but there are other ships that overlap their bases so I am pretty sure it will be fine. Also there is no noise in space, but what can you do? Pew, pew pew, vwoosh, pew pew! !